The Niguma Variety Store opened in Hood River in 1905 on the corner of First and Oak Streets, and included a mailhouse, Japanese social center, boardinghouse and brothel. 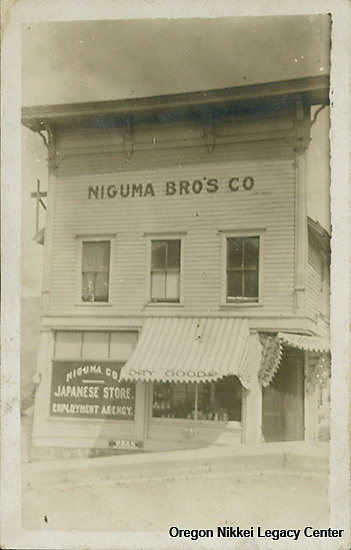 Brothers Renichi Fujimoto and Masuo Yasui purchased the Niguma family business around 1913. However, the Yasui Brothers enterprise really began in 1908 when they purchased their first store from the Anderson family. Co-proprietor Masuo Yasui was a community leader who helped many Issei. "A typical Saturday night for a bachelor was a walk into town, go to the Fuji pool hall and take a Japanese bath. When he smelled good, he would go to the Niguma store to look at the girls. Maybe eat at the Okawa Noodle shop then back to look at the girls." – Mr. Chiho Tomita, Mid-Columbia JACL Notebook. Photo: Gift of Rose Niguma.